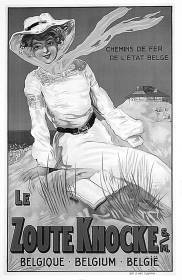 A detailed study of the tourist poster for the belgian coast from 1887 to 1970, this standard reference book includes more than 100 previously unpublished works, a 30 page reference section with a poster catalogue, footnotes, biography of the designers, bibliography, register of places, years, designers and printers. The catalogue accompanies an exhibition at Venetiaanse Gaanderijen, Zeedijk, Oostende (BE), June 01 - November 9, 2003. See the Belgian Poster Pages for more details about the exhibition. During the Nineteenth Century, the cities of Ostend and Blankenberg took the lead in the development of thermal tourism on the Belgian coast, with the smaller councils quickly following suit. 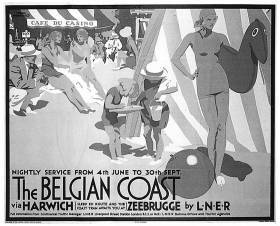 The new railway and tram networks made the fashionable and rural seaside resorts accessible for the wealthy and self-sufficient'bourgeoisie'. In addition, the colourful poster images did not fail in having a bewitching effect upon the public at home and abroad. The said cities initially placed their orders with renowned companies in Paris, but they quickly knocked on the doors of printers and designers in Liege, Brussels. Coastal tourism was largely build up from fortunate gentlefolk from the "hinterland". 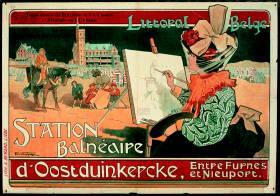 The economic and cultural environment, which included private businessmen, maintained good contact with the lithographic printers and 'avant-garde' artists' who gained great respect for the Belgian posters. In this way, the pearls of 'art-nouveau' design by De Rycker & Mendel, Goossens, Mertens and Benard emerged, drawn by Toussaint, Cassiers, Van Rijsselberge, Gouweloos, Stevens, Crespin and Duyck. If we also include the signatures of foreign commissions, then this list demands even more respect: Tamagno, Bourgeois, Gray and Bouisset. About the most popular motif at that time was the liberal presentation of the "L'heure des bains", which portrayed the comings and goings on the sea dike, the flaunting about on the sand and the curative bathing itself. On the beach paraded fashionable ladies with parasols and high-class gentlemen wearing suits, with straw hat and walking stick. On the eve of the First World War, people joined forces with the printers who allowed their permanent designers to create models, a tactic that became common practice during the period between the two World Wars. The enjoyment of the cures of the sea or the pleasures of the casino and luxury hotels opened up the field for the lure of the sun. The introduction of "paid leave" in 1936 brought a stay in a family hotel or camping site within the reach of many. Designers were rather inspired by the (somewhat provocative) French than by the (more respectable) British coastal posters. The portrayal of a female bather with the seaside in the background also won popularity. However, it took a long time before the bather, as sole figure in the poster, made her awaited entrance in the role of temptress. From the 1930's, federal or regional organisations also became interested. After the war they resolutely decided to become even more involved. Initially, due to the concentration of resources and expertise, they stood as guarantor for high quality. In their contemporary designs, Capouillard, Verbaere, Brocorens, Conrad, Setola and Pasture conjured up the unique image of sun and sea, water and beaches, dunes and dikes, which were now accessible for everyone. The wave of modernisation which occurred in the 60's led to the aberration of the banal photographic poster, as when Councils took the rare initiative for a graphic poster, due to their limited resources and experience they usually stayed with a local trusted designer. In addition to the previously quoted names, we would also like to mention Mignot, Bailie, Marfurt, Delamare and also Evenepoel, Ost, Herge, Ibou and Richez who created designs that unfortunately were never produced. Eleven years after the publication of the first Belgian coastal posters book, the publisher Marc Van de Wiele (Bruges) published "Affichekunst-aan-zee", a new reference book and retrospectively the largest ever about this sacred subject. Even the most sophisticated poster-lover could find what he/she wanted. In addition to new names and data, it also contained more than 100 'never-shown'creations, an inventory of all preliminary and text variants plus unique archive documents and analysis of style and iconography. Furthermore, the book rose to the place of the promotional poster in the wider sense of (inter)national tourism propaganda. Karl Scheerlinck is an art historian living in Antwerp who has published many books on belgian posters and poster designers. 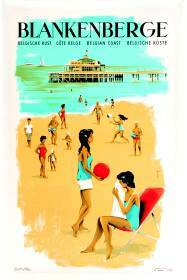 More posters and poster news from Belgium can be found on his web site Belgian Poster Pages . The above review was first published in the Van Sabben Catalogue of Poster Auction 22, October 26, 2003.